If your baby has just started walking, garden safety has probably been the last thing on your mind. A long winter, albeit milder than previous years, has kept us indoors through the crawling stage but we are about ready to venture into the great unknown :). Once a baby begins to walk however, a lot of fun can be had and it’s a wonderful time as a parent. No longer are you restricted, as a toddler can accompany you to the greenhouse(being careful of the glass itself) or play safely in the garden as you weed the vegetable patch. This is hardly possible with crawling babies as the danger of sharp rocks and stones, hard surfaces, and even pebbles can graze those little knees, and it would be pretty impractical to fit knee pads on them! After a year or more of compromising on any free time bar the two naps a day that are normally consumed by cleaning the home, it is extremely liberating to be presented with a walking mini human being that can now become involved in your favourite pastime. You will find that jobs take twice or even four times as long as they used to however it’s never too early to introduce a child to the benefits of gardening. 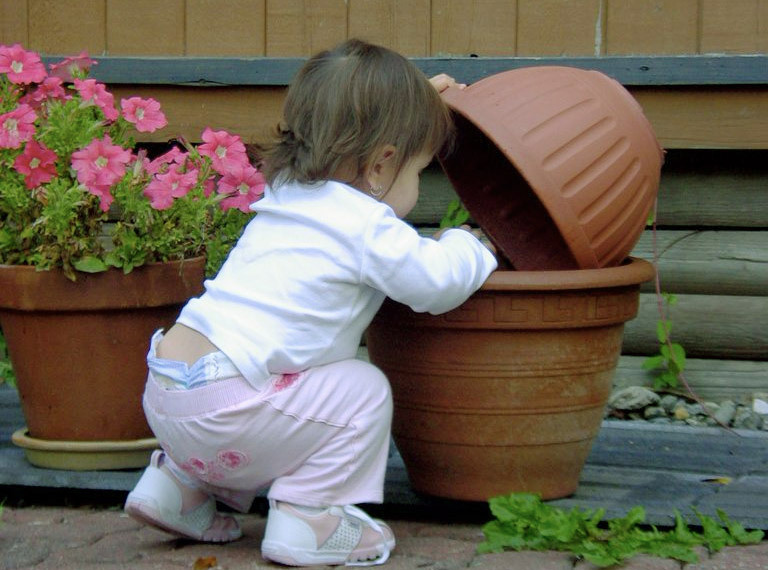 For your own sanity and for the toddlers safety, it is worth spending a day simply toddler proofing the entire garden. Although you will no doubt keep a strict eye on your little one, once they do begin to walk, it’s not too long before they learn how to run. Make sure that all garden tools have a sensible storage place, and especially the cutting tools such as secateurs or saws. You will be surprised at the amount of hazards an ordinary garden can hold, a perfect place of peace for grownups can be a recipe for disaster for little ones. Compromises must be made and you may need to accept that your chic adult garden will now need to become a miniature playground. For example your gas barbecue should probably be tucked out of the way with a nice cover on it rather than the centre piece of the patio and plant pots with prickly shrubs will need more consideration. One of the first things to look at is the hanging baskets. They are like a magnet to kids and they will pull at them. If loose and they fall, that much weight could do serious damage. Ponds are especially dangerous, as toddlers love to play in water, like magnets to metal they will be drawn to the water, desperate to dunk their little feet. Not a year goes by when the news doesn’t broadcast tales of accidents and worse. Covering ponds with wire, such as chicken wire will ensure that if a toddler does fall, they won’t reach the water, whilst you can still enjoy the fish or the pond plants beneath. This serves a double purpose as in autumn as the leaves fall you’ll find it catches most, keeping the pond clear. This is a right result because it’s obviously way too wet for the leaf vacuum if they fell to the water and saves considerable time on raking and picking up by hand. The good news is the compost bin won’t be empty. It may help deter cats from swiping the fish too! There are also plants that should be avoided in a child friendly garden as their pollen is quite poisonous; these include Foxgloves and the Laburnum tree and a different danger to the prickles we’ve already mentioned. The garden also needs to be completely secure, no matter if you live in the middle of nowhere or deep within an urban area, there are hazards everywhere beyond the garden gate. Be it traffic, tractors, rivers or steps, your toddler will want to explore, and just one quick escape will leave you half grey! Make sure there are no holes in the fence, get on your knees and check if you have to. It’s also worth investing in some secure locks for the greenhouse and shed, putting tools away and locking away all pest control products will make sure those little chubby hands don’t touch anything they’re not supposed to. 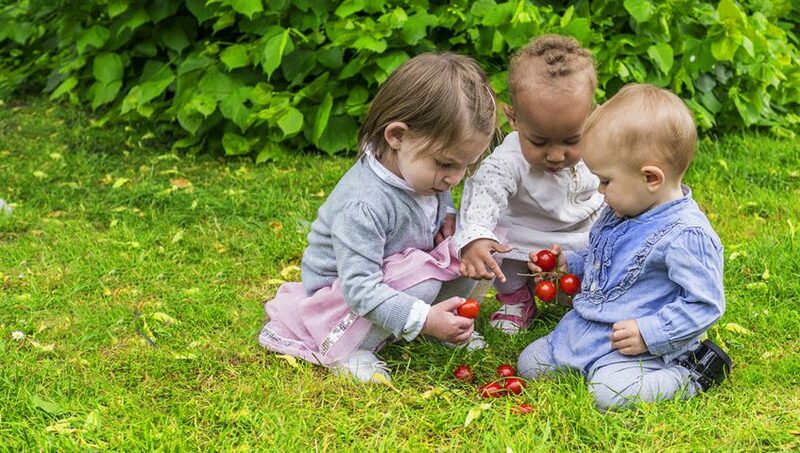 Above all though have fun, if budgets allow clear an area of lawn and invest in a swing, a slide and a sandpit, after all there will be plenty more sunny days to come as your toddler grows and flourishes along with your glorious garden.